As the trust barrier of a marketplace increases (based on its underlying dynamics) the more important it is that the platform help to match buyers with appropriate sellers. Here I outline a framework to help enumerate, and rank, methods on-demand marketplaces employ to qualify their providers, and aid buyers in finding the ones most qualified for their needs. In a previous post, I outlined 7 types of marketplaces, where I showed why higher-order marketplace types carry a more significant trust barrier for buyers to initially overcome. As such, there is a greater onus on the platform to guide its buyers on which seller is the right fit for them. The new breed of on-demand marketplaces carry more of this burden than first-generation marketplaces, or “directories” (e.g. Craigslist), since these platforms fully intermediate transactions, and thus must essentially underwrite the quality of its supply to make the marketplace dynamics work. Similar to Maslow’s hierarchy, I believe that there are “baseline”, and subsequent, factors that build successively on one another. 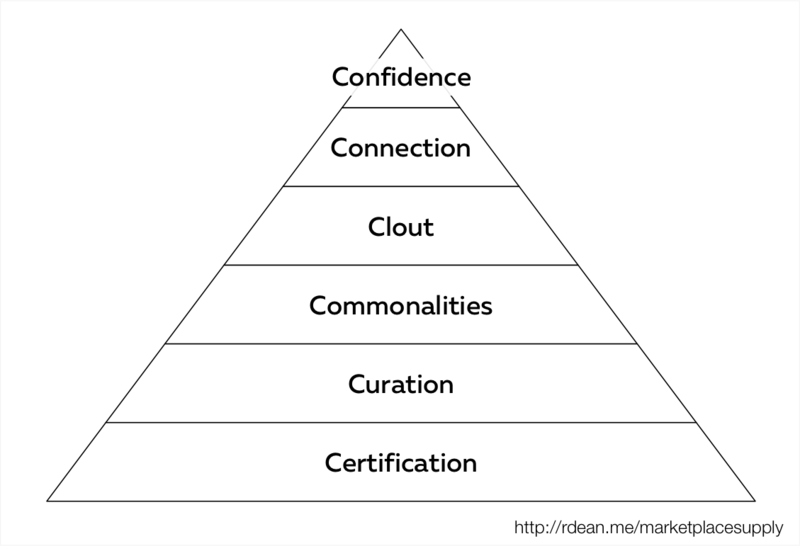 Therefore, I’ve organized the strategies on-demand marketplaces employ to qualify their supply into the following tiers on a pyramid…as readers of this blog know I’m a sucker for alliterations, so I’ve named each of the tiers using “6C’s”. Let’s examine each tiers of the pyramid in detail. At the base of the pyramid, or its most fundamental level, are the baseline measures a platform uses to provide safety and security, and to weed out bad actors. Techniques like id verification, background checks, or other safety screens are often employed at this tier. Therefore, this level should be considered a “floor” for on-demand marketplaces, where first generation marketplaces (directories) may not even provide this qualification. The next tier in the pyramid is comprised of the manual measures platform operators employ to inspect prospective providers. These include techniques like fingerprinting, interviews, social media screens, and assigning “badges”, or other accreditations. As such, the platform qualifies sellers based on “soft” attributes that would not be readily caught by the tier 1 verifications. Enabling connections based on social affiliations helps to drive matchmaking through a sense of “borrowed” trust. For example, knowing a provider attended your alma mater, or belongs to the same community group, are helpful ways to convey trust through shared associations. Many times, these affiliations are self-reported, or verified via social logins (e.g. Facebook, Twitter, LinkedIn). However alternate methods, like location, can be employed to make connections, such as recommending a provider that is “used by your neighbors”. In essence, the stronger the degree and number of connections, coupled with the level of verification of these associations, the higher the rate of matchmaking on first-use. Once the dynamics of the platform have had time to work, the supply-side begins to accumulate a “reputation” based on their performance. Tools here are both user-reported (e.g. ratings & reviews) as well as measured (e.g. time to respond to a request, punctuality to appointments, reuse rate). The more these factors are surfaced to the buyers, the more a sense of trustworthiness is connoted. Further, the platform can choose to prune poor performers based on these metrics, in order to keep the quality threshold high for new buyers. As platform usage increases, network effects within the “buy-side” begin to unfold, where buyers begin implicitly and explicitly endorse providers to other (or prospective) buyers. For example, warm introductions from friends, colleagues, and acquaintances can occur to yield recommendations like “top rated by your friend Rishi”. Therefore, this type of social proof, or endorsement from friends, and affiliated acquaintances, serve to further bolster a sense of trust in providers. At the top of the pyramid, a positive history between specific buyers and sellers forms over time. Such relationships may form initially either via the platform, or alternatively have occurred offline, and then brought onto the platform. While the former is clear, an example of the latter is the babysitting marketplace Chime, where offline relationships between families & sitters are allowed to be onboarded onto the platform. To adequately enable this type of relationship, the platform must incentivize users such that it is better to manage the existing relationship on the platform vs. off of it, for example to take advantage of cashless payments. Moreover, the platform must make affordances that honor the subtleties of these pre-existing relationships, like allowing users to set their own personal rates, and adjusting the “rake” accordingly. Thus, this is the most difficult tier for a platform to achieve, in that it needs to incentivize users so highly to reverse any disintermediation effects, but is by far the most powerful mechanism to engender trust. In marketplaces where trusting providers becomes more important, the higher the “base” the platform must deliver. Doing so enables buyers to overcome their initial adoption of the platform, and their continued use creates “same-side” network effects, helping to pave the way for later adopters. These levels of the pyramid must be layered on top of one another, either explicitly or implicitly, in the order shown here, as skipping levels is not possible. At the highest level, great marketplaces not just keep these relationships on the platform, but encourage offline, trusted relationships to be onboarded and managed. To do so, we’ll dig more into strategies to avoid “disintermediation” (i.e. keep interactions on the platform) in a later post.